Guten Abend, everybody! Whoo hoo!!! 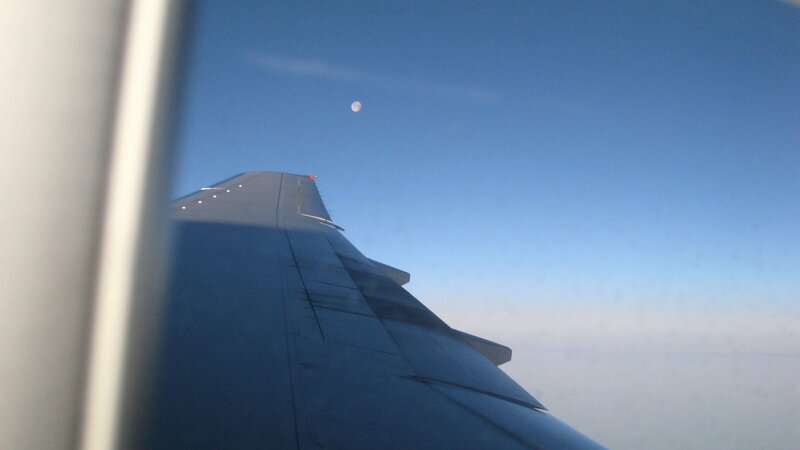 I’m writing 35,000 miles above planet Earth while flying in an Austrian Airlines B77 to Vienna, Austria. Estimated arrival time: 7:48 am, Viennese local. And due to a sweet in-our-favor jet stream, our pilot estimates the flight lasting about seven and a half hours, as opposed to nearly nine. Go jet stream! So I’m a little excited OK? And why shouldn’t I be?? I’m on an airplane to Vienna sipping Zweigelt and awaiting my shrimp on a creamy cucumber salad, grilled chicken breast (or mushroom ravioli – still haven’t decided), and my Austrian style mocca cream cake. 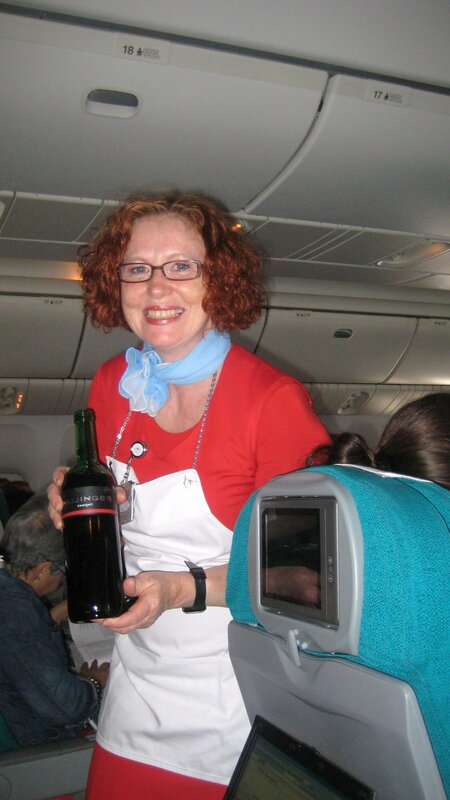 So far the Austrian flight attendants have been efficiently friendly and nice. Or in other words, they’ve been Austrian. Wow their outfits are colorful, though! The women are decked out in cherry red from head to toe. I’m talking red stockings and shoes, too. Reminds me of an all-red outfit I was fond of wearing as a kid. The plane itself is also a bright, cheery conversation piece. Lots of bright, neo-mod colors…red, turquoise, teal, lime green. It’s a neat diversion from the usual red, white and blue you see on other airlines. I must say I’m also impressed with the entertainment collection aboard the plane (or maybe I just haven’t flown in a while and am behind the times). Movies, music and more to peruse through. I started watching Marley & Me, but realized I’d rather read the book first and turned it off. Plus I’d rather do a little writing. I’m not on the Internet now obviously, just in good old MS Word. Tomorrow morning after we check into the hotel my boss Steve has to go to two back-to-back meetings with other Austrian clients of Brand Action Team (Oval Vodka and Absinthe Mata Hari). Sooo, my treat is to not have to attend, but rather take a day-long walking tour of the beautiful city of Vienna. Sitting next to me I have a copy of Steve’s Frommer’s Vienna & the Danube Valley. There are a few chapters on what to see and do in Vienna if you’ve only got a day, so I’ll be studying those closely before landing. Tomorrow evening at 7 pm all guests of the Austrian Wine Marketing Board’s Wine Summit 2009 are meeting at the Heuringer Zahel for a introductory get together and night of Viennese wine. I’m looking forward to that! I’m also eagerly anticipating drinking rich coffee, noshing on sweet Austrian desserts (Sacher-Torte, anyone??? ), and of course discovering, learning about, and tasting new-to-me Austrian wines. Wow I’m hyper! I still need to take my sleepy time pill to be well rested for when we touch down on Austrian ground. By the way how cool is JFK airport in terms of the international variety of people and airlines? Living in little ole’ Avon, CT makes ya thirst at times for greater diversity. Overall I’m pretty psyched for this journey. I expect to return home with a wealth of Austrian wine knowledge and hopefully new friends made. Ooh! Do I see dinner trays being passed out? 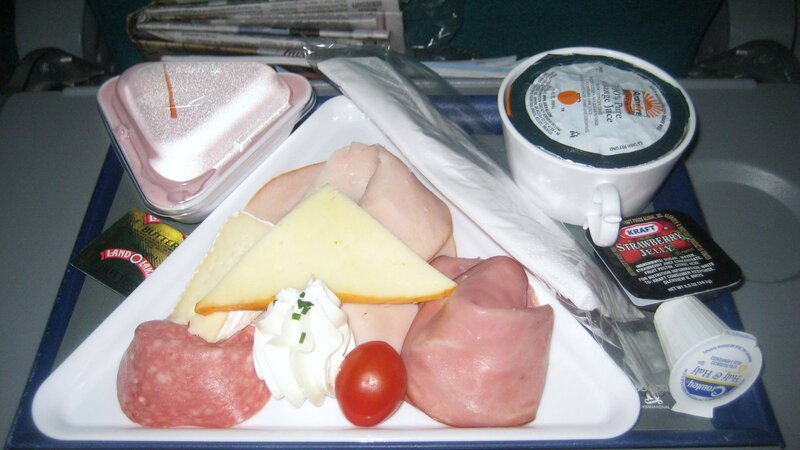 Am I the only person out there who actually likes eating airplane food? And why not? 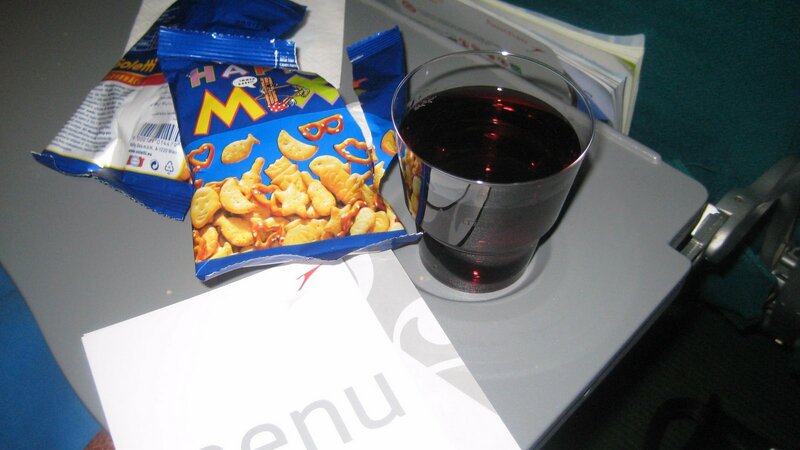 It’s like a little TV dinner, but cooler because you’re in the sky, usually going somewhere cool, like Austria, to meet its people, and drink its wine. Cheers and goodnight, everybody. Here’s to a safe landing. I’ll see you in Austria. ← I’m leavin’ on a jet plane…to Austria!